Thanks for making Line Break #18 a triumph! A gigantic thanks to everyone who turned out for our eighteenth regular episode of Line Break this past Sunday, at beautiful Q.E.D. in Astoria, Queens. Just by showing up and giving us the gift of your attention, you helped make the afternoon bigger and better than it would have been without you. Thanks as always to Q.E.D. for giving us the space and an opportunity to use it. And thanks especially to our amazing readers, who made it the incredible show it turned out to be. Madina Papadopoulos brought us a backroom portrait of Cinderella's stepsisters. Stephanie Grossman delighted us with tales botched directions and random meetings gone right. Theresa DeLucci unsettled us with an enumeration of the murderers we meet in our lives. Jackie Sherbow read us her evocative poetry. Justin Weinberger took us gambling with Mark Twain on the Mississippi after the zombie apocalypse. And host William Shunn introduced us to a poetic puppy at the crossroads of racial relations. Reminder: Line Break #18 is this Sunday afternoon! 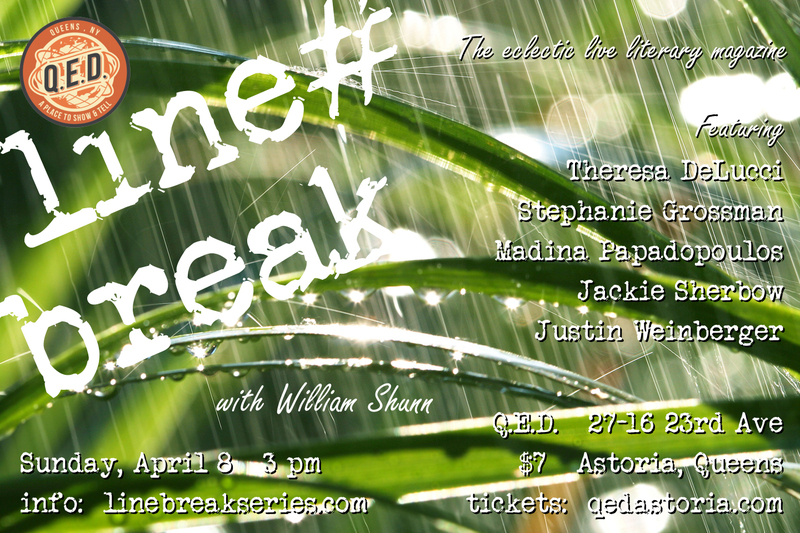 Just a reminder that Line Break, the eclectic monthly live literary magazine, returns this Sunday afternoon in a special Sunday Edition in Astoria, Queens. 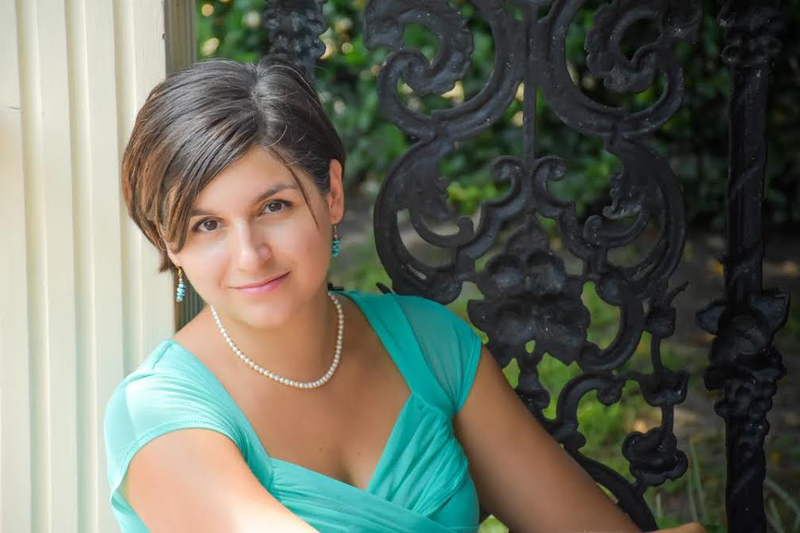 Sunday, April 8, 2018, 3:00-4:30 p.m.
Madina Papadopoulos is a New Orleansborn, New Yorkbased freelance writer and author of The Step-Spinsters, a fairy tale retelling of Cinderella and her stepsisters. She studied French and Italian at Tulane University and went on to pursue her MFA in Screenwriting at UCLA. After graduating, she taught French and Italian to children in early childhood and elementary school programs. Her nonfiction freelance writing focuses on food, drink, and entertainment. She will probably be friends with you if you have a dog. You can follow her at @madinapaola on Twitter or at @unspunfairytales on Instagram. Please join Madina and all our incredible readers for Line Break #18, Sunday, April 8, 3:00 p.m. at Q.E.D. in Astoria. Tickets are only 7 bucks! Stephanie Grossman is a writer and marketing professional in New York City who has worked for publishing companies like Simon & Schuster and Penguin Random House. She currently works at JSTOR, a scholarly research library. 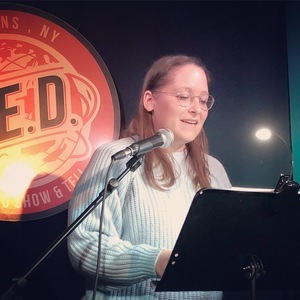 Along with recent publications in Hobart, Paste Magazine, and Hypable, Stephanie has been a winner of Creative Nonfiction's Tiny Truths micro essay Twitter contest, and she's also appeared on stage at The Moth. In June 2017, she received a Mark Bourne Scholarship to attend the Speculative Fiction Writing Workshop at the University of Kansas. She lives in Astoria, Queens, and finally has a cat. Find her online at anxietyofauthorship.com and follow her on Twitter at @StephMGrossman. 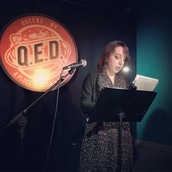 Please join Stephanie and all our talented readers for Line Break #18, Sunday, April 8, 3:00 p.m. at Q.E.D. in Astoria. Tickets are only 7 bucks! 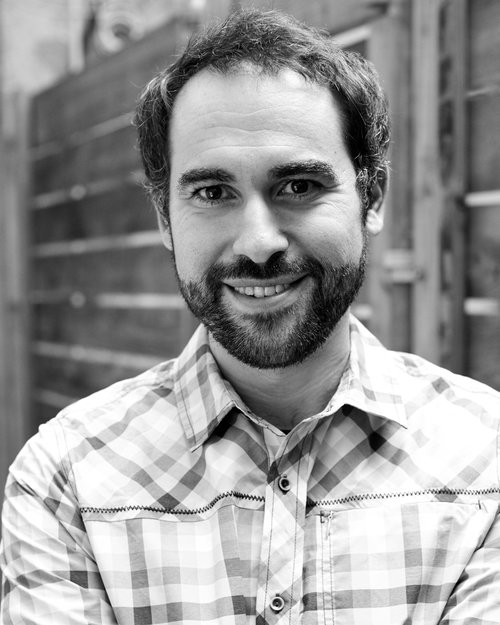 Justin Weinberger is a novelist and television writer. His first middle-grade novel, Reformed (Scholastic Press, 2017), is available now, and his work can also be seen in the latest season of The Americans, airing in 2018 on FX. Originally from in Easton, Pennsylvania, Weinberger now lives in Brooklyn. 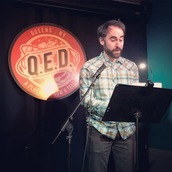 Please join Justin and all our world-class readers for Line Break #18, Sunday, April 8, 3:00 p.m. at Q.E.D. in Astoria. Tickets are only 7 bucks! 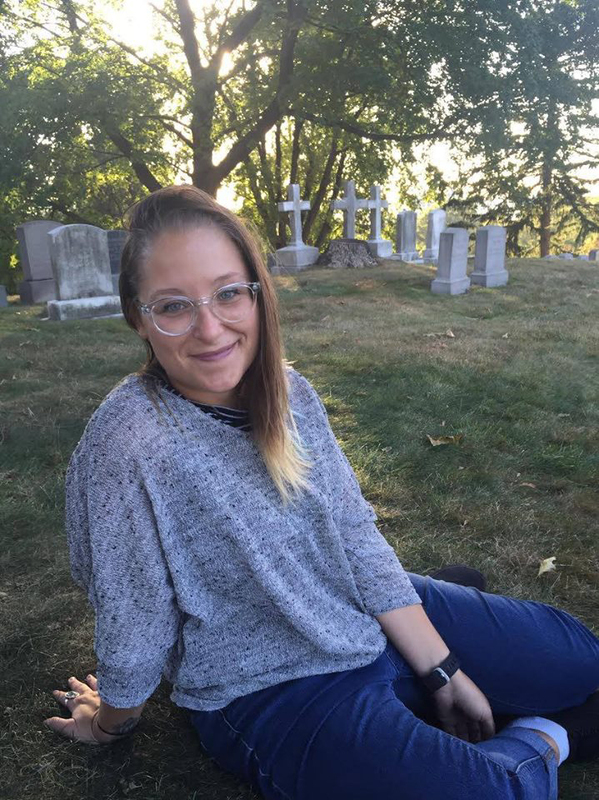 Jackie Sherbow is a writer and editor living in Queens, NY. 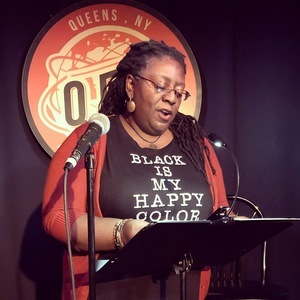 Her poems have appeared or are forthcoming in places like Occulum, Bad Pony, Luna Luna, Day One, and The Opiate, and have been part of the NYC-based Emotive Fruition performance series. She works as an editor for two leading mystery-fiction magazines (Alfred Hitchcock's Mystery Magazine and Ellery Queen's Mystery Magazine) as well as Newtown Literary, the literary journal dedicated to the borough of Queens. 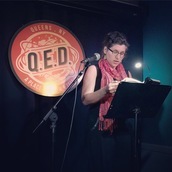 Please join Jackie and all our talented readers for Line Break #18, Sunday, April 8, 3:00 p.m. at Q.E.D. in Astoria. Tickets are only 7 bucks! 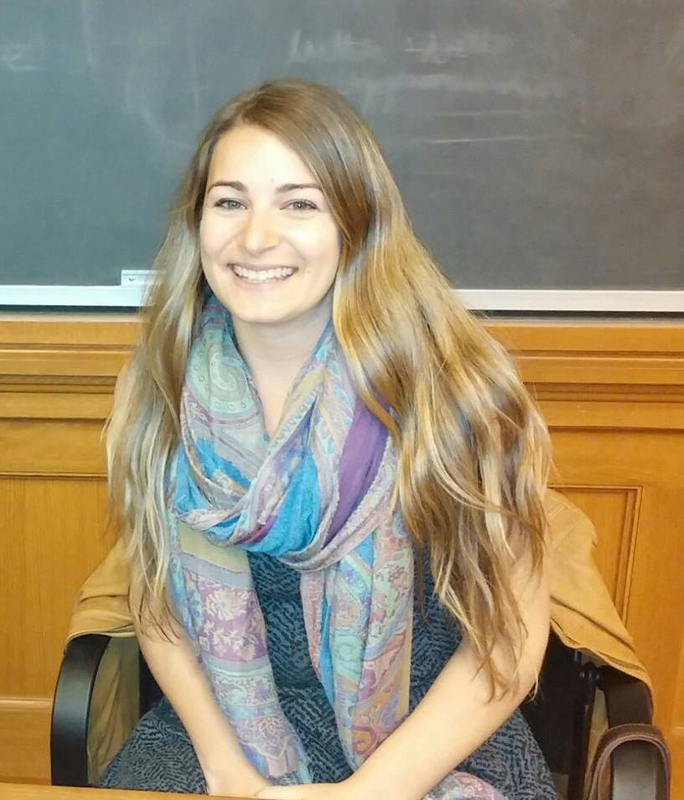 Theresa DeLucci is an alum of the Clarion West Writers Workshop. 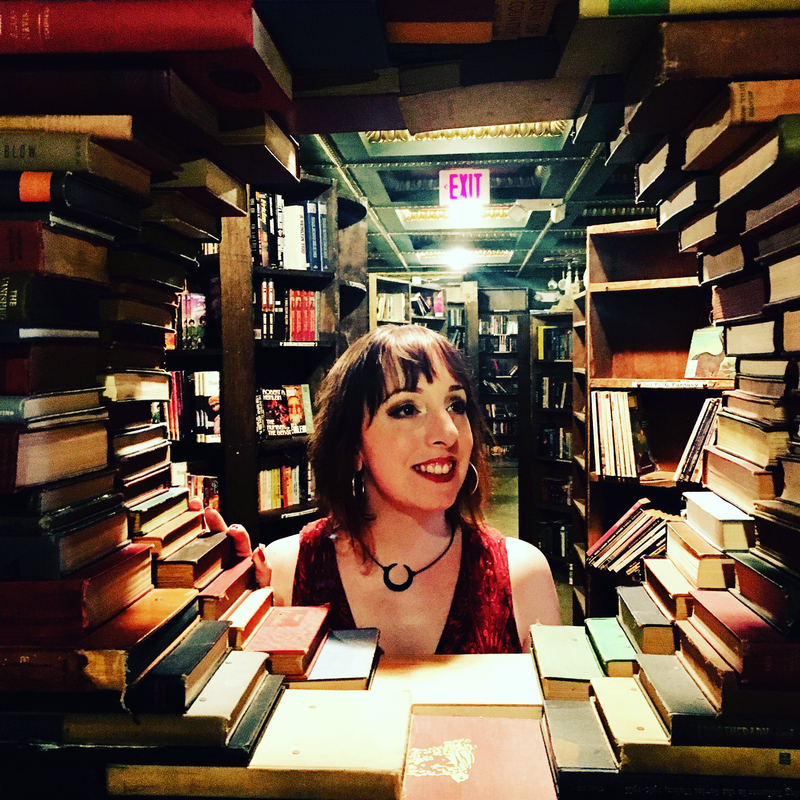 Her fiction has appeared in ChiZine and on Tor.com, where she is a regular reviewer of horror and New Weird fiction, and, as the only staffer willing to pay for HBO, Game of Thrones and Westworld. She is also a frequent guest on Wired.com's Geek's Guide to the Galaxy podcast. 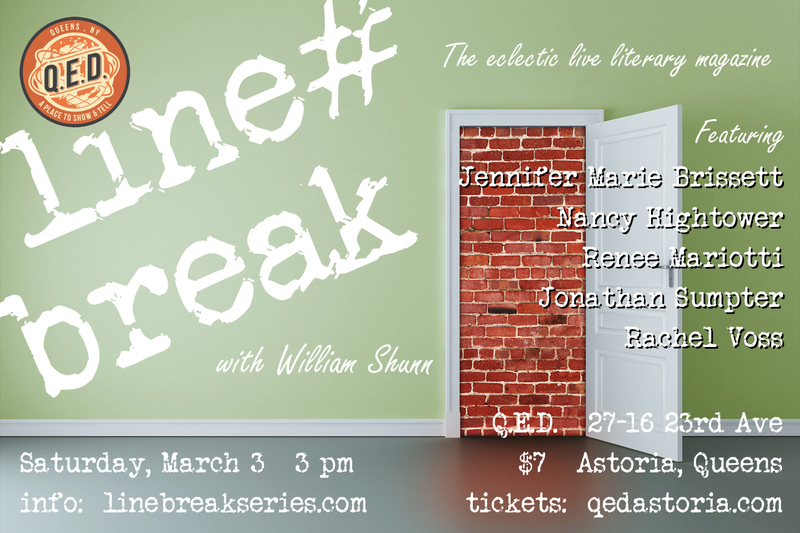 Please join Theresa and all our world-class readers for Line Break #18, Sunday, April 8, 3:00 p.m. at Q.E.D. in Astoria. Tickets are only 7 bucks! Schedule Change Alert! Please note that our April episode will take place on a Sunday, not a Saturday. Line Break will then be on hiatus for the month of May and will return June 2nd. Line Break is here again! It's the eclectic monthly live literary magazine where poetry meets prose, fact meets fiction, and high-brow meets low-brow, this time in a special Sunday Edition in Astoria, Queens. Thanks for making Line Break #17 one for the books! A gigantic thanks to everyone who turned out for our seventeenth regular episode of Line Break this past Saturday, at beautiful Q.E.D. in Astoria, Queens. Just by showing up and giving us the gift of your attention, you helped make the afternoon bigger and better than it would have been without you. Thanks as always to Q.E.D. for giving us the space and an opportunity to use it. And thanks especially to our amazing readers, who made it the incredible show it turned out to be. Host William Shunn invited us into the chatroom with Mötley Crüe's Nikki Sixx and Tommy Lee. Jonathan Sumpter took us on a harrowing tour of a remote, half-built hotel. Renee Mariotti shared an anatomy of an agonizing #MeToo moment. 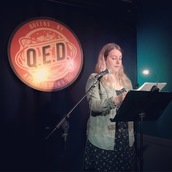 Rachel Voss shared her vivid poetry. Nancy Hightower took us backstage with the televangelists among whom she grew up. And Jennifer Marie Brissett had us reaching for our hankies with the gut-wrenching story of a very unusual execution. If you couldn't make it out on Saturday, please mark your calendar for our special upcoming Sunday edition on April 8, when we'll we back with our eighteenth issue featuring Justin Weinberger, Jackie Sherbow, Theresa DeLucci, and more. We look forward to seeing you again in April! Until then please check out all the terrific shows and events at Q.E.D. There is something amazing happening there literally every day. Reminder: Line Break #17 is this Saturday afternoon! Saturday, March 3, 2018, 3:00-4:30 p.m.